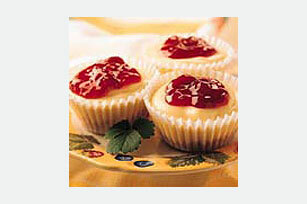 A no-bake cheesecake mix makes these little gems a breeze to prepare in paper-lined muffin cups. Serve them anytime—as a special dessert. Mix Crust Mix, sugar and margarine with fork until crumbs are well moistened. Press firmly onto bottoms of 12 paper-lined or foil-lined medium muffin cups. Beat milk and Filling Mix with electric mixer on low speed until well blended. Beat on medium speed 3 minutes. (Filling will be thick.) Spoon evenly over crusts. Refrigerate at least 1 hour or until ready to serve. Spoon fruit topping over cheesecakes just before serving. Store leftover cheesecakes in refrigerator. Prepare as directed, using JELL-O No Bake Strawberry Cheesecake Dessert.